PS I Love You was written primarily by Paul McCartney around the time of The Beatles' 1962 trip to Hamburg. It was first released as the b-side to their debut single Love Me Do, and later appeared on the Please Please Me album. The sentimental lyrics of PS I Love You proved especially popular with The Beatles' female fans, and it soon became a fixture of their live shows. That's Paul's song. He was trying to write a Soldier Boy like the Shirelles. He wrote that in Germany or when we were going to and from Hamburg. I might have contributed something. I can't remember anything in particular. It was mainly his song. Initially the song was mooted as a possible a-side, a notion that Richards quickly dismissed. "I was originally a music publishing man, a plugger, so I knew that someone had already done a record with that title," he said. He was referring to a 1934 song by Gordon Jenkins and Johnny Mercer, originally recorded by Rudy Vallée. The Beatles first recorded an unknown number of takes of PS I Love You at their first Abbey Road session on 6 June 1962, with Pete Best on drums. Then, during the second Love Me Do session on 11 September, they remade it in 10 takes. Ringo Starr didn't play drums on the record. Producer Ron Richards brought session player Andy White in as a replacement, as Ringo hadn't proved good enough during the band's 4 September session. Ringo, sadly, was relegated to maracas during PS I Love You. The Beatles recorded PS I Love You three times for BBC radio sessions. The versions appeared on the programmes Here We Go (recorded 25 October 1962), Talent Spot (27 November) and Pop Go The Beatles (17 June 1963). 1) There is no real lead guitar in here. George is playing a Gibson Jumbo like John and it’s also just an acoustic rhythm part what he played. 2) Again, like on the song “Please Please Me”, I would distinguish the vocals: Paul is on lead, John is doing harmony (and backing), George sings backing. 3) There are no drums in it, Andy White played percussion (woodblocks). That’s great – thanks for the information. All improvements and amendments are always welcome! There is certainly lead guitar with tremolo throughout the song, most notably accenting Lennon’s backing vocals (“Treasure… words… together… forever…”. I’d like that to be corrected. So Harrison played acoustic guitar and lead guitar. I always thought it sounded like a hi-hat and rim-shots. I’ve heard it thousands of times. Now I have to REALLY listen to it! ? Such a cute, brief little ditty! I always liked this one. For me, it’s all about the “You you you” hook and the one-word-per-bar backing vocal. I think it’s a necessary song. I simple little track that was a slight departure from their rhythm/lead/bass/drums basic setup of virtually all of their early work. I see why it would be a hit live with the ladies. The recording sounds a bit muffled to me for some reason. I would like to have heard it live to see if there was a difference in quality. Not one of my favs on the album, but a good B side. Surprising pick to go with “Love Me Do” though, as it’s even slower than that number. But they picked up the pace very soon. I don’t believe it was a case of Ringo not being good enough. I’ve heard George Martin say in interviews that he didn’t even know everything about Ringo coming in to be the drummer and had already hired and paid for Andy White to do the session. And since George had already paid for White, he was going to use him. Afterwards when George got a chance to properly hear Ringo play, he quickly got the job. Very underrated song and record in my book. Beautiful melody. Still boggles the mind that a 20 year old, self-taught `kid’ could write this! Can anyone tell if it is John or Paul that sings the “Ohhh” at about 1:24 just before Paul chimes in with “you know I want you to remember..”? It sounds like John at first, but it also sounds like the voice Paul uses when singing the “you know..” part. It’s bugging me that I can’t tell! The first ohh is John, then Paul´s : You know I want you to remember … and, at last, George gives us a yeah ! I have always thought it was Paul for the three parts. Still thinks it’s Paul. Definitely Paul. Listen to Live at the BBC. It’s clearly him on that cut. Why would they perform a “harder” take on the “live” version? John sings the exact same style “Ohh! !” on All I’ve Got To Do. On PS I Love You, it is indeed John first, then Paul, then George’s “yeahhh”. I fun little piece of trivia! Wow this is the first I’ve ever heard of this and it just blew my mind!!! That’s so awesome, it’s always been one of my favorites and now this just makes it so much better!!! Thank you Beatle Buddies!!!! Yes !! Finally someone else hears that “summer” thing too. Anybody else hear the mellotron chord mistake at 0:24 ? The ” summer ” really sounds like John. Are you sure it’s Paul’s singing that ? It is John singing, “…in summer” and Paul singing, “…meanwhile back” …no need to drive yourselves crazy…it is exactly what it sounds like! Like in “Like dreamers do” Paul sings Elvis´s style. June 6 – Pete on drums. George Martin doesn’t like it, tells Brian Epstein that a session drummer will be used on all future sessions. Sept 4 – Since George Martin is supposedly unaware that Pete’s out & Ringo’s in, Andy White is booked & on Stand-by (possibly in another room or the Control Booth, with The Beatles unaware). Once George Martin is aware of the drummer change, he decides to try Ringo out as long as he’s there. Many times a session musician will be called & not used. Sept 11 – Andy White is booked & used at this session to see if there is any improvement over the previous one. There isn’t. Take the tambourine off of this day’s version of “Love Me Do” & this day’s & the Sept 4 versions are virtually identical. I’m trying to look at this from George Martin’s point of view at the time. If he was unhappy with the June 6 session, & was under the impression that Pete was still with the group when the Sept 4 session rolled around, why wouldn’t a session drummer already also be booked for that day? Why would George run the risk of having two sessions in a row with (what was to him at the time) unsatisfactory drumming? Not having a session man at the second session when the first one was unsatisfactory just makes no sense to me. This is how this confusion got resolved in Lewisohn’s book “Tune In”. As you say, on June 6th George Martin wasn’t happy with Pete & decided to use session drummers from then on, next – before September 4th – George’s assistant (later to become his wife) Judy Lockhart-Smith was notified by Brian Epstein that the Beatles have a new drummer, Ringo. On this second session, things were going well, until – as Ringo says himself – he had a mad moment when he decided to beat his drums with “maracas in one hand & tambourine in the other” instead of sticks. He was SO terrified of his first recording session with the band and of George & Judy, who were “awfully uppercrust” & “posh” in Ringo’s mind. Because of that “mad moment” Andy White was brought in next week. Ringo had NEVER forgiven George Martin for that decision & ALWAYS reminded him of it, although it wasn’t necessarily his decision, but Ron Richards’ (George’s recording assistant). Some months later on November 16th 1962 Beatles & George had an “eye-opening” meeting where George decided to make an ALBUM with them. He committed that day to fully producing them. 10 days later, “Please Please Me” single was recorded with Ringo & now all was well. That’s how it happened! It´s interesting that their first single contains TWO Paul´s songs, considering John was the lead singer on most of the songs those early years. Even on stage. Just funny. 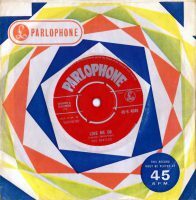 Love Me Do was co-written according to Paul. Prior to the recording, John sang lead on stage. Paul sang lead for the recording because John had to play the harmonica. Both guitars are electrified acoustic Gibsons I guess. Agreed Chip. PS was the stronger musically and received numerous radio requests despite being tucked away as a B side. I don’t know,but while love me do reached about number 16 on th e charts I feel ps I ole you could have gone to no 1.I love it. Wow no one seems to mention how John’s one word per line backing vocals only lasted until 1:36, when he sings the whole line in harmony with Paul. For me it’s John backing vocals that makes this song so appealing! studio situation where Ringo used a matchbox for “tapping” sound while recording P.S. I Love You. While always believing that to be true, I find no mention of it anywhere. Am I wrong? Was it a different song? The Maraca’s are not that believable and the woodblock is a Maybe? HELP!